If you’re interested in the NHL and statistics (like us), you may have heard of something called the Corsi number. It’s one of many new methods to measure player performance being tracked by bloggers (like Behind the Net). Perhaps because it’s new, it’s not popular with traditionalists; witness Don Cherry’s rant against Corsi on Coach’s Corner last season. Despite misgivings over siding with guys who go with their gut, I agree with Cherry. The Corsi number is flawed. But it takes a better effort than Cherry’s to appreciate just why. What is a Corsi number? The Corsi number puts a premium on players who tend to spend most of their time in the offensive zone. If, when they are on the ice, there are more shots directed at the opposition net than their own, players will have a positive Corsi number. And the greater the shot difference (as measured by Corsi), the better the player. Does shot difference make a difference? But is it necessary for teams to outshoot opponents in order to outscore them? Not in every game, of course, but is it true on average? In the shots for and against stats for the 2009/10 season, the correlation between the shot difference and winning percentage is fairly high (0.63). On average, it appears winning teams tend to outshoot their opponents. This seems to support the idea that the Corsi number can be used as a proxy for performance. But, if you take a closer look, the support falters. Teams that outshot their opponents won 580 games in the season. How many games did the outshot teams win? 588! More teams had a higher winning percentage when they were behind on shots (19) than when they were ahead (11). And a team’s winning percentage didn’t change by much whether it outshot or it was outshot by opponents — about 8% on average. If outshooting opponents is pivotal to winning games, we’d expect this difference to be wider. Instead, we see that a team’s ability to win games was fairly independent of its ability to outshoot opponents. Why? Teams shoot to score goals. And, depending on who’s ahead, each team’s incentive to score another goal (and hence take shots) is different. It’s always more important for the team that’s ahead to prevent a goal than to score a goal. Similarly, it’s always more important for the team that’s trailing to score a goal than prevent a goal. 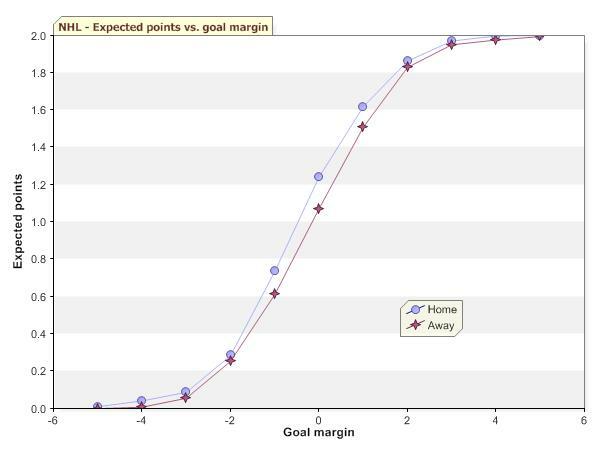 To put it in economic terms, the marginal value of a goal is higher for the team that’s behind than it is for the team that’s ahead, and the marginal cost of a goal allowed is higher for the team that’s ahead than it is for the team that’s behind. The biggest problem with the Corsi number is that it assumes that incentives stay the same throughout a game. It penalizes players when they’re protecting a lead and have little to gain by venturing aggressively into the offensive zone. And it rewards players who are taking the space their opponents give them and taking shots from all angles without affecting the outcome of a game. The value of a goal? It depends on the score. Think of each NHL game as moving through a discrete set of states designated by the difference in goals from the home team’s perspective. The game starts tied (0); the home team scores (+1); the home team scores again (+2); the away team scores (+1); the home team scores again (+2); the away team scores again (+1); and the game ends 3-2 for the home team. The home team gets the win and two points, the away team gets the loss and no points. That’s the story of one game. When you look at a whole season’s games this way, you can calculate the points that the home team earned on average when tied, ahead by a goal, ahead by two goals, trailing by a goal, and so on. You can, of course, do the same for the away team. If you actually did the calculations and plotted the results, you’d get a graph that looks pretty much like the one below. Of course, the expected value of a goal should take into account the time remaining on the clock as well as the difference in score. A tying goal in the last minute of a game is worth more than a tying goal in the first minute of the second period. But this is a fairly straightforward correction. How can we use goal value to measure performance? It’s simple: performance measures should focus on goals, not shots. And the plus/minus stat should be calculated using the expected value of a goal, because, as we’ve seen, some goals are bigger than others. (An alternative is to only count go-ahead and tying goals.) This way we adjust for context when measuring performance. And we make sure we get a measure of performance when the outcome of the game is still being contested, that is to say, when performance matters most.